The department is concerned with advanced research in the areas of basic and clinical Pharmacology and Toxicology that serve community needs. Pharmacology is a multi-disciplinary science with many subspecialties including, for example, cardiovascular pharmacology, behavioural pharmacology, neuropsychopharmacology, pharmacogenomics, pharmacogenetics, and immunopharmacology. Moreover, Toxicology offers the study of the adverse effects of chemicals (including drugs) and environmental agents on living systems and the means to prevent or ameliorate such effects. The objectives of the department are to introduce the students to the interactions of chemical substances (drugs) with living systems, with a view to understanding the properties of drugs and their actions, including the interactions between drug molecules and drug receptors and how these interactions elicit an effect and may also produce adverse effects. Dr. Hebatalla I. Ahmed, Associate Professor and Head of the Department of Pharmacology and Toxicology. 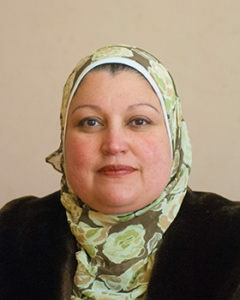 Dr. Hebatalla I. Ahmed is an Associate Professor and Head of the Department of Pharmacology and Toxicology. She earned her PhD in Pharmacology and Toxicology from Al- Azhar University. Read More.